We're clearly lovers of Japanese food at The Urban List. From tataki to teriyaki, udon to oolong we can't get enough of the food from the land of the rising sun. We find even more of Sydney's best Japanese restaurants! Missed part 1 of the best Japanese restaurants in Sydney? Head here to check it out. Ryo's Noodles is Japanese fare without the pomp and circumstance, but (occasionally) with the queues of a Sunday morning in Surry Hills. The crowds are a testament to the unbeatable simplicity and affordability of Ryo's famous ramen. Choose from a pork tonkotsu-based broth, or a lighter chicken one. Amp up the spice with the chili soy offering, or opt for the sour flavoured soup with prawn parcels. Mappen is a self service udon bar in the middle of the city. Serving up super affordable, super tasty meals you can score yourself lunch or dinner for under $10! Sure, there's usually a line but it moves quickly and you'll be slurping down delicious udon faster than you can say arigatou. This tiny little izakaya in Darlinghurst is so home-style Japanese you actually feel you've been transported to Japan. Sit and admire the vintage Japanese posters lining the wall and indulge in their impressive range of sakes. Not sure which one? Just point and hope for the best. Pair your drinks with an assortment of traditional Japanese foods and you've got yourself a fun and tasty dinner. When something's under the wing of the Merivale group, you know it can only be good. Seats are arranged around an enormous marble bar, where head chef Nobuyuki Ura and his team transform fish into works of art. At Sushi e there are the traditional scallop, salmon and tuna sashimi offerings, and the more substantial 8+ score wagyu beef and chicken teriyaki mains to fill you up. Finish the meal off with a green tea matcha parfait, airy yuzu mousse or purple sweet potato tempura. Tetsuya's needs no introduction. Its famed French-Japanese fusion has reservations pending and wallets emptying. From the intimate garden outside the premises, to the fragrant truffle butter offered upon arrival, the Testuya's experience is nothing if not immersive. Pace yourself through the ten course degustation and relish each bite. With three stars from the Good Food Guide Under $30, Yachiyo delivers quality with affordability. Grab a few salmon and kingfish nigiri, or go straight for the wagyu cheek katsu, soy-caramelised leek and shredded lamb croquettes. Yachiyo's specials include sashimi tuna bruschetta, blue swimmer crab sushi rolls and crunchy lotus root salmon rolls. Don't forget to complement your meal with some sake from the hefty selection of drinks. Sushi, teriyaki, bento udon – Raw Bar has it all covered. Experience the offerings as a smorgasboard of small dishes, from maki handrolls and ikura sashimi, or go for a bento box with sashimi, tempura and miso soup. Indulge with sake from Nara and Hokkaido for an authentic night. 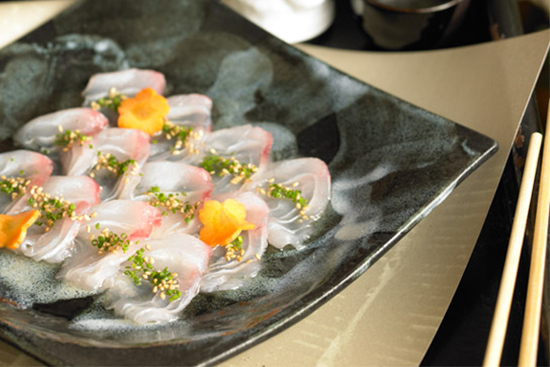 Housed in the microcosm of gourmet and glamour that is The Star, Sokyo delivers ambience and flavor with aplomb. Traditional dishes get a contemporary facelift in selections like Hokkaido scallops with yuzu honey, or the Kurobuta pork belly with ginger salted caramel. With an incredible fresh sashimi and tempura selection, it's tempting to fill up on savoury dishes alone, but you don't want to miss out on the caramelised white chocolate and black sesame ice cream for dessert. Hungry for more of Sydney's best Japanese restaurants? Head here.